Chinese Green tea is light and refreshing. Well known for its many health benefits, Chinese Green tea helps to prevent cancer, lowers cholesterol & blood pressure, strengthens the immune system, prevents cavities, reduces stress and regulates ageing. This is a beautifully subtle pleasant tea. I love that the leaves are slightly bigger and sink to the bottom so you can use them again and again in the same cup. Taste is great, no dust. Will be buying again. good tea with a fresh taste. I will definitely buy it again. The leaves smell sweet and fresh; when wet, they resemble melon seeds, hence the name. The brew has a smooth, sweet, nut-like flavor that is slightly reminiscent of toasted pumpkin seeds. One of the best green teas I would recommend to serious connoisseur of Chinese loose leaf tea drinkers. Tea arrived when expected. Flavor and quality is very good. Would recommend. Really nice green tea that isn´t the best of them but for a fresh spring tea, you really can´t beat the price. If you are just starting out on tea or want to try something a little different I would recommend it. We drink this tea for the first time. For those who love the Long Jing teas this tea is very recommended, you may find complimentary flavors between the two. Just tried my first cup this morning. My friend and I agree that this tea has a more complex, "wet" flavor than my normal Dragonwell (Long Jing) green. I am enjoying it very much and find it complementary to Long Jing. The leaves are gorgeous in color and shape, as well. Highly suggested for a new dimension in green tea. Best green tea ever, refreshing taste and affordable. Recommended! Excellent tea, and one of the most antioxydant based on amny studies! I enjoy this tea a lot. It´s very refreshing, I like it for hot weather. I always find myself making a few cups a day if I have it. You really can´t go wrong with this, pick some up. Great tea at a really nice price! Refreshing and tasteful! I rate this batch of tea as good, but have ordered it before and the taste was much better. There seems to be a lot of inconsistency with this tea. Great taste, not expensive, a lot of antioxydants as you can see in some studies. Excellent tea, very refreshing and one of my favourite to drink. Un grande classico il Luan gua pian per me. Nn c´è stato anno che nn l´ho preso e nn mi ha mai deluso! Straconsigliato! Very big tea leafs. The flavor depends on the time of the extraction. I recommend to make it for no longer then 2 min. Recommended. Great all aroung tea, great taste avec very powerful! As always, one of my favourite tea of my collection! One of my favourite tea, a lot of antioxydants and caffeine! This is an excellent tea. It has a very complex flavour that evolves for up to thirty seconds after drinking a sip from the first infusion. The second infusion is also very flavourful. I can recommend this very high-quality tea. Fresh taste, good green tea to drink daily. One of my wife´s favorites. Just an okay tea nothing to write home about. If I had a choice in ordering it or take a chance on something which I was unsure of, I would choose the latter. I ordered this item before, after i found it the BEST. Placed one more order but this one came really really different, not sure why. As always, this is the best tea you can buy for the money! Always satisfied with this tea. Nice and refreshing! Отличный чай, свежий аромат, приятный вкус. Not my favorite green tea (long jing), but I enjoy it very much and it has a smooth taste. Nice a bit more mature leaves. Gives a stronger more robust taste than for example LJ. I like it a lot! Will order again. This is a pleasant, smooth Chinese Green. Notes of Asparagus and succulent greens. The leaf is large and beautiful and turns a vibrant green in the water. I live in England. The tea arrived quickly within a few days of the order. I don´t really know much about green tea but to me this has a clean maybe uncomplicated taste which is a lot better than the green tea I can get locally. I also think it is good value. I have learn´t not to brew it too hot and the exact brewing condiitons do make a difference. I was not impressed by this tea, it lacked any floral characteristics whatsoever (I brewed it differently a few times to see if it was just a poor brew, i.e hotter/cooler water, more/less time, more leaves), and in short, tasted like grass. It wasn´t an unpleasant taste (if you´re into vegatal tasting tea, I guess you´d have liked the taste), but was very boring and not something I´d drink for pleasure. Perhaps there was a mistake at the packaging warehouse, such as old tea being mixed in with fresh, or non-airtight storage, etc, as others seem to have been impressed, though I´m not risking wasting more money on this tea. Отличный зеленый чай, по праву занимающий место в 10-ке знаменитых китайских чаев. Выдерживает несколько заварок, не теряя свойства. One of my favorite teas. It´s not too strong. Hits the tongue just right. Serves as a great wake up in the morning. Почему-то меня этот чай не впечатлил. Вкус не очень насыщенный, хотя и терпкий, листья красивые, ярко зелёные. Возможно надо использовать немного больше чайных листьев при заварке, а может быть у меня просто мало опыта употребления зелёных чаёв. Чувствуется свежесть травы, очень хороший чай. This has been one of my favorite teas over the last couple of years. It has a light, sweet vegetal flavor. The flowery aroma is similar to greenish Tie Guan Yin, though it’s a bit milder. Slightly nutty taste, but not grassy. Easy to brew (rarely gets bitter) and an excellent value. this is the best-bang-for-the-buck green tea! it´s on par with other top green teas, but only for about half the price. It´s a very interesting tea,that taste a little bit like Long Jing plus a floral taste. Very nice green tea, with a strong, pleasant after taste. Not being an expert I really like this tea. Firstly, the price is great and I got up to 7 cups from just a few leaves. Nice color and even better taste. The leaves seem a bit darker compared to my Sencha but I guess it´s a result of the different processing. Finally, I will definitely repurchase. i am glad to finally meet this tea! first brewing is perfect flavour. after flavour looses its matureness. pleasant aftertaste. Very reliable, dark green, vegetal, round cup. Good on a cold day. Can´t go wrong with TeaSprings Lu An Gua Pian - it tases as good as others Lu An Gua Pian that´s usually more expensive. Maybe this tea has not the best leaves, not the finest aroma and is overall fairly average. What makes it so special is the American Ginseng and Liquorice Grass - it really ennobles the leaves so that this tea will find its place in my tea-fridge. I recommend to start early with this tea. Otherwise it´s midnight and you´re still not done brewing tea. 8-10 times is absolutely realistic. After the 3rd time it turns into a average Oolong-like tea with the typical tea-house taste. I enjoy every cup, from the first to the last. I am too lazy to right reviews but I have to say that this Lu An Gua Pian is much more better than I purchased last time on Ebay. There is no any sign of bitterness the taste is grassy and vegetable and reminds Tie Guan Yin. Gua Pian tea has a wonderful aroma and a refreshing and sweet aftertaste. Very nice tea! Nutty and with a hint of flowers like a green Tie Guan Yin. High-quality tea. It is important to learn how to brew it properly. Tastes like fresh mown grass. This tea is full of pleasant flavor, not too much citrus. For the price, this one is really great. I think that the 2010´s Lu an gua pian is the best that I ever drink! What a tea!!! Medium orchid fragrance and slight aftertaste. Can be infused several times with good results. The flavor is full, buttery, and extremely satisfying. 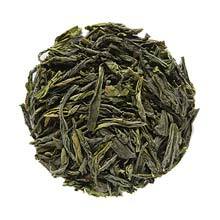 Many of the strident grassy notes of other green teas do not exist with this type of green tea; this LAGP has a smooth, full, and strong yet rounded taste, with medium fragrance, sans strong bright smoky or grassy notes. The leaves are intact and whole (a few broken leaves) and look beautiful and verdant when dried or steeped. The quality and price is superb for this lower grade of LAGP. Highly recommended! Excellent tea. Very aromatic and tasteful, but comparatively fast it looses it´s aroma. An excellent everyday green tea. For the price it cannot be faulted. Maybe lacking that something special to make your guests go ´wow´, but they will certainly make appreciative noises. This tea is truly a great green tea. I served it to my family and relatives and they all loved it. Twice excellent. Absolutely wonderful. A very nutty aroma and flavor. Kept steeping short and just a few leaves gave me 6 good infusions. A dream of a tea. It is a nice, refreshing green tea with a light scent - too light to my liking. Having said that, I would recommend Lu An Gua Pian for anyone who likes green tea. Refreshing even to the palette, good refreshing tea leaves. Was expecting a little better. Taste of deflating with shades of cheap tea. However, bought a cheaper type of tea. It´s been a while since I last ordered this tea. Amazing colour, great taste. One of my personal favourites. I so enjoy the fragrance rising as I pour the water over the tea leaves. I immediately relax with a smile on my face. This tea is gentle on the palate with a smoky finish!! Not sure if the tea is stale, but the flavor is so delicate as to be almost non-existent. There is a slight vegetal aroma, but again, very slight. I will try a larger amount for my teapot, but so far I am not impressed with this tea. Never tried this tea before and did not expect it to be so good. Now it is one of my favorite green teas! Leaves look ravishingly, taste and aroma are very complex, pleasurable and strong. This tea is very good for several infusions, up to 5. I truly recommend it. Good tea with an incredible fragance! I suggest short infusion from 1 minute to 1 minute and a half. I love this quality, inexpensive Lu An Gua Pian, which is as good as more expensive versions. A warm, inviting cup that I send to friends as gifts. This is one of my favorites green tea! beautiful very green tea leaves. no dust, extraneous debris. strong taste. This was good, wouldn´t say that it was complex, the taste kind of reminded me of a green Taiwan oolong. OK, just not the blow me away character of other teas available here. Great green round warm cup. Just what you expect from this tea. I´ve paid more in the past for a tea of this quality. An excellent tea. Even better than last year. Floral aroma, smooth, refreshing taste, and good for multiple infusion. P.S., the tea leaves look much better than those in pictures posted here. The aroma of this tea was very good, and I enjoyed the strong flavour. Gorgeous dark green leaf, attractively vegetal aroma, smooth and mellow, moderately full-bodied but not overpowering. A satisfying choice on a rainy afternoon--and other times as well. I find it difficult to make it properly. Too long it´s bitter, to short it does not have enough taste. But the ones I did make properly, are excellent. Pretty good tea, just not overwhelming... which is good and bad. It is not disappointing, but I don´t think it stands out enough for me to try it again. Let me be clear... I am no green tea expert and I typically drink Oolong and Puerh´s. This tea seemed of good quality with nothing about it that seemed "wrong". Balanced flavours and easy to drink. To my inexperienced green tea taste buds it was a pleasant green tea and I enjoyed a robust element that many greens don´t have for me. I´ve tried a few greens now but nothing has grabbed me like Oolongs and good puerhs do. This is no exception. Lovers of green tea should probably ignore my comments! Lichte zich niet opdringende groene thee voor elke dag. Frisse verkwikkende toets. Aftreksel vergeeld enigszins vlug bij warm houden op theelichtvuurtje. Great tea. Very fresh and floral odor with sweet tasting. One of my favorite green teas. A good tea. Floral and sweet tasting. Definitely great for everyday drinking. this tea could easily compete with long jing as my everyday tea. i really enjoyed it. Refresing after keeping it over one year. Good to chage the taste. This was the first time I’ve tried this tea. Very pleasant, smooth and refreshing. I personally like the bi luo chun better, nevertheless a good tea to try out. This is becoming one of my favourite green teas. Bright emerald green leaves and brew, and a clean cup of delicious tea each and every time! A very delicate taste. Sweet and herbal. Keep attention to the brew to let the tea to express itself at the best. Refreshing with pleasantly sweet after-taste. Good value for money. Highly recommended. Leaves have a fantastic rich green color and the aroma is very fresh and long lasting. It’s a very good tea, it’s the 3rd or 4th time that I buy it. Brewed at 175 degrees F. Light green clear tea, with fruity aromas. The aroma tends to get a bit weaker by the third infusion, although the taste is just as strong after the third infusion. Very smooth, full, refreshing sweet taste, which lingers in the mouth for a condiderable time after drinking. Very good tea, would recomend to anyone. A very fragrant and interesting tea that always satisfies. Highly recommended. Spring 2007. Light vegetal taste with a hint of sweetness at the end. Refreshing. When opening the bag of tea my first observation was how beautiful and green the leaves are! The taste is mild with a vegetable like aroma. This is a fine quality tea but need to have a little extra leaf weight when brewing for optimal flavor. This has become one of my favorites, and for the price I’m very pleased to have it as an everyday tea. It has a wonderfully full and sweet body with a silky smooth mouth feel that you don’t usually get outside of the Taiwan high-mountain wu longs. The taste and aroma have a sweet grassiness that is unlike any of the other green teas I’ve had, and has a nice and lasting finish. The only downside is that you have to pay attention to not over-brew it. It can be a little temperamental sometimes, and can acquire a penetrating bitterness if over-brewed, but it’s not too hard as long as you pay attention to time. Amazing tea! This tea is one of the best that I have ever tried. Looking forward to the new 2007 batch. Very full flavored green tea. Mainly vegetal, but some floral character is in the background. Very fresh and lively. totally cool tea ! different than any other green teas i’ve had- but not like oolong either...... the infusion is a dazzling neon green. i cant describe the taste... but its very exciting exquisite!!! Better and not as muddy as another Lu An Gua Pian I’ve tried. Don’t know if I agree with its inclusion in the Ten Famous Tea, but perhaps that’ll change in time. Good for everyday drinking. One of my favorites. Vegetal taste, simple beautiful leaves. Very pleasant. I am really very impressed with this tea. I’m normally a (fragrant) Wulong fan, and this actually reminds me quite a bit of one, but with a definite (although subtle) green tea quality. It’s highly complex, light, smooth, a bit crisp, a great and lasting aftertaste, perfectly balanced astringency, an aroma like a gentle creek in the woods in spring, and overall just makes you want more :) This has become one of my favorites, for sure, after just one cup - especially for the price. I will very definitely be buying more, as this is something that I want to drink all the time. It is an excellent tea. one of my favorite green tea. Refreshing and tasting. I did not appreciate immediatly; more of other teas it needs much attention in brewing (right water, right temperature, right time of infusion). When you find the perfect combination, lu an gua pian really shocks you! Very refreshing and it stimulates imagination. Beautiful large green leaves. A vibrant color in the cup. I do three infusions and each one is gorgeous. A smooth sweet almost slightly tangy sort of taste that I find very appealing. A very pleasant afterataste. I find a temperature of at least 170F is best. Definitely a great tea. One of the best green teas that I’ve tasted. From the moment I opened the bag and beheld the beautiful, distinct, large, flat, forest green leaves, I just knew I would like this tea. And it did not disappoint me!!! Lovely sweetish aroma and a very agreeable sweet vegetal flavor with many quality infusions makes this tea one of my favorite greens of the 2006 harvest. This tea is not overly assertive but is not shy either, however, I go a little high in leaf weight used for best results. Beautiful green tea ! There’s nothing to add to its name ! One of the greatest green teas i ever tried ! great tea very enjoyable..liked after a meal.